The main difference between buffered and unbuffered RAM is that the buffered RAM contains a register between the DRAM and the memory controller while the unbuffered RAM does not contain a register between the DRAM and the memory controller. RAM stands for Random Access Memory. It is a nonvolatile memory that requires a constant flow of power to retain data. Usually, the programs are stored on the hard disk. It requires more time for the CPU to access the hard disk. Therefore, at the time of execution, the programs are loaded into RAM. The capacity of the RAM is a considerable factor in determining the performance of the system. There are mainly two types of RAM called SRAM and DRAM. SRAM is a fast memory built using flip flops. DRAM is fast but not as fast as SRAM. 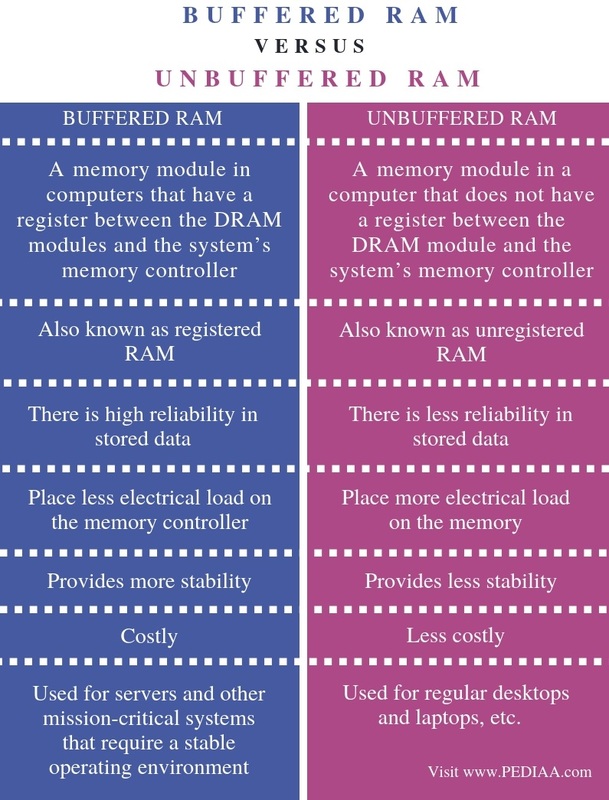 Other than these two types, RAM can also be categorized as Buffered and Unbuffered RAM. In buffered RAM, there is an additional register between the DRAM and the memory controller. It is also known as registered memory. This memory helps to place a less electrical load on the memory controller. It allows a single system to remain stable without using more memory modules than in a usual system. Buffered RAM is used for high-end systems such as servers and systems that require a stable operating environment. It is rarely used on desktops and laptops. Sometimes, it is possible to recognize buffered memory in RAM as there are additional chips in the middle of the module. In unbuffered RAM, there is no register between the DRAM and the memory controller. So, there is direct access to the memory controller. It also places a high electrical load on the memory controller. Unbuffered RAM is more suitable for desktops, laptops etc. because it is less expensive. On the other hand, unbuffered RAM does not provide much reliability on stored data. It is also not very stable. Buffered RAM is a memory module in computers that have a register between the DRAM modules and the system’s memory controller. Unbuffered RAM is a memory module in a computer that does not have a register between the DRAM module and the system’s memory controller. This explains the difference between buffered and unbuffered RAM. Registered RAM is another name for buffered RAM while unregistered RAM is another name for unbuffered RAM. There is high reliability in stored data in buffered RAM. There is less reliability in stored data in unbuffered RAM. While buffered RAM places less electrical load on the memory controller, unbuffered RAM places more electrical load on the memory. Buffered RAM provides more stability to the system than unbuffered RAM. Buffered RAM is costly than unbuffered RAM. Whereas buffered RAM is used for servers and other mission-critical systems that require a stable operating environment, unbuffered RAM is used for regular desktops and laptops, etc. The difference between buffered and unbuffered RAM is that buffered RAM contains a register between the DRAM and the memory controller while unbuffered RAM does not contain a register between the DRAM and the memory controller. 1. 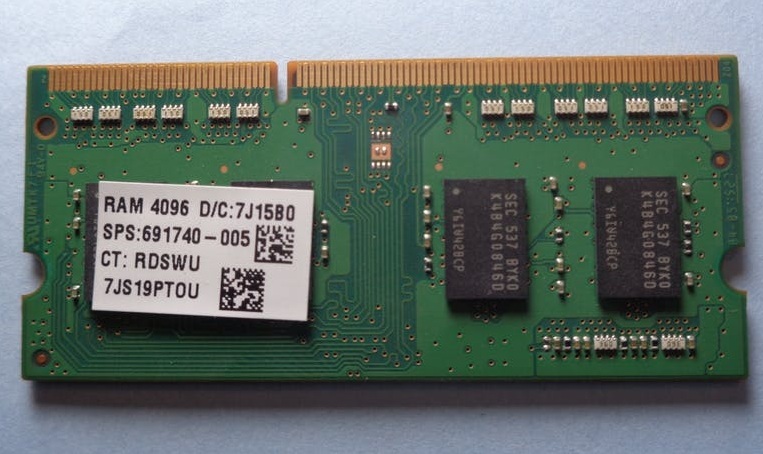 Understanding PC Memory – CompTIA A 220-901 – 1.3, Professor Messer, 29 Nov. 2015, Available here. 2. “Registered Memory.” Wikipedia, Wikimedia Foundation, 26 Aug. 2018, Available here.